The big news still is that my Patreon page has launched! Everybody (even at the $1 subscription) who joins between now and October 15 will be eligible for the first Original Painting Giveaway. We've got a bunch of friends up there now, and plenty of room for more - especially for those of you who want to get the perpetual 10% off discount (even works on sale prints, like the new ones I'm debuting today!). All of this, FAQ and more can be found at my Patreon page here, and further down in this update for details. Kansas City folks! The KC Renfest hast started! Details are on my event page here . My permanent gallery will be open every day at the Renfest for the entire season, and I myself will be there in person the last week of September and the first week of October (and I'll be painting!). One of my very large marine/ocean themed paintings (along similar lines to my Manta Ray Mermaid and Big Blue Whale large-scale sea paintings), this beauty debuted and SOLD at DragonCon 2015. Abyssal Mermaid brings us down into the deepest darkest parts of the ocean, the abyssal zones where no light reaches. 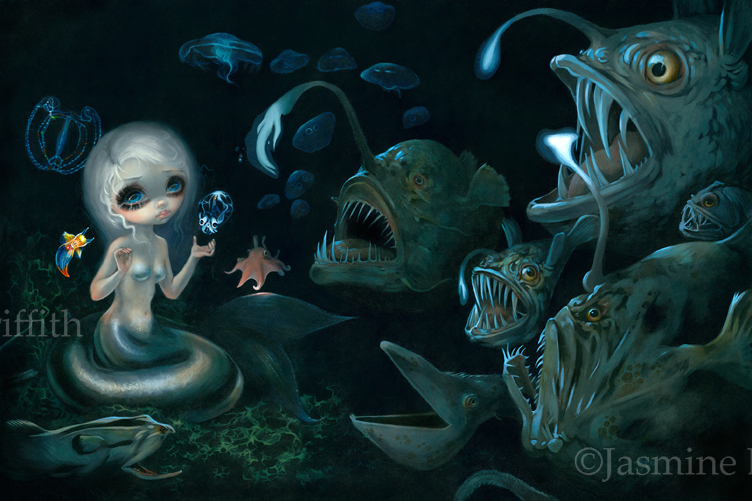 Many deep-sea denizens appear in this painting, in particular my beloved bioluminescent creatures - anglerfish, gulper eels and more! And of course - a beautiful mermaid will swim in the murky depths, accompanied by a sea butterfly, a glass squid, and a darling little dumbo octopus. One of the largest paintings I've done, I had such a fun time with this one! Egyptian Chariot - a fabulously whimsical addition to my "Chariots" series, with an Egyptian theme. She's cradling an Anubis canopic jar, sits in a Egyptian style golden chariot, and is totally totally made up in Dynastic glamour. Her balloon also has vaguely Egyptian (in a 19th Century Wedgwood way) hieroglyphs, and in the distance are pyramids in a neo-classical Egyptian idealized Victorian landscape in the background. Love this piece! Framed she is nearly five feet tall, an incredibly ornate 60"x20" frame as shown above, interior panel measures approximately 38"x11". If you are interested in the original painting, contact Pop Gallery - call 407-827-8200 or email popgallery@me.com - they are located here at Downtown Disney in Florida and are happy to ship WORLDWIDE. I have joined Patreon to create a space for myself and for my fans, collectors and patrons to connect and interact in a way beyond that of existing social media. Patreon is where you will find exclusive content unavailable anywhere else, advance notifications and sneak previews, receive surprises (including my monthly Original Painting Giveaway), see a lot of "Behind the Scenes" photos, and depending on what patronage tier you subscribe to - even get "first dibs" and "reservations" on original paintings and hard-to-get Limited and Masterpiece Editions. Full members will be able view original paintings before they debut to the public. Works-in-progress will be posted here FIRST. All starting at just one dollar a month. Click here to see my page, the different subscription levels, and more. At the $5 level you'll also get access to my "behind the scenes" photo feed, featuring stuff that you won't see on Facebook or Instagram. Fun stuff from my studio, more detailed works-in-progress, pics of us setting up for art shows, Matt, I, the kitties, vacation photos, things along those lines that I don't typically share with the general public. At the $50+ level in addition to the discounts, giveaways and "behind the scenes" feed, you will also have private access to the "Top Secret" level. This is where I have things I absolutely can't show anybody else yet (in fact you'll have to confirm you've read our short Non-Disclosure Agreement which we will send you if you subscribe at this level). Stuff like full versions of finished paintings before art show debuts, the very first WIPs (to get your "first dibs" requests in early), opportunities to reserve limited editions before they are released, previews and announcements on private projects, and more. Click here to see my page, the different subscription levels, the FAQ and more. I really appreciate the support you all have given me over the years, every little bit helps, and I think this will be a really fun way to get to know you guys better and vice versa!